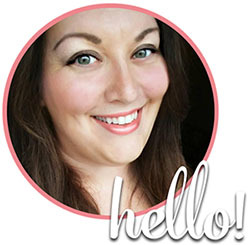 This week’s $5k Wedding Wednesday post focuses on first impressions. I’m talking invitations. The invitation sets the tone for your soiree. Is it a casual beach theme? A romantic rustic retreat? A posh modern EVENT? 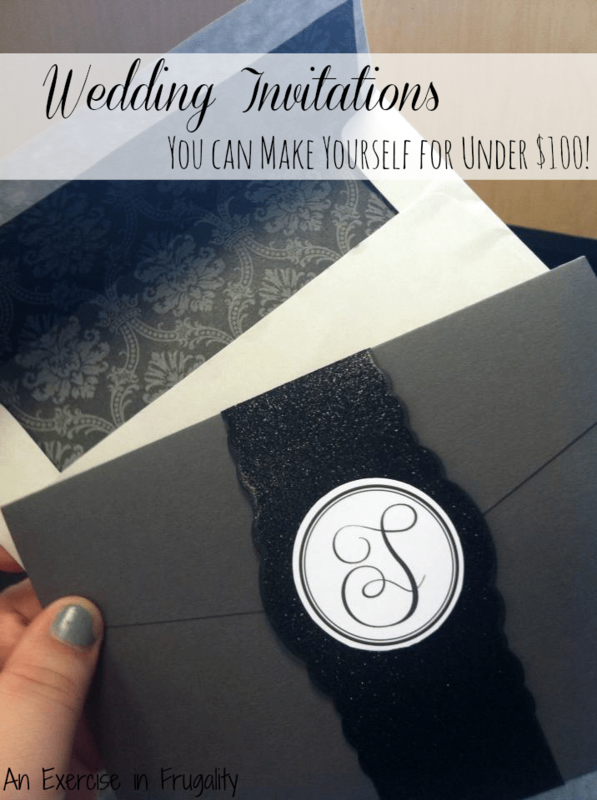 The invitation tells a lot about the wedding to come, but if you’re like me (and if you weren’t, you probably wouldn’t be reading this…) you don’t want to spend a fortune on your invitations. Let’s be realistic. Say you invite 100 people to your wedding. 75 of them are going to reply, enter the date into their iPhone or Outlook and toss the paper invitation in the garbage. 20 of them are going to stuff the paper invitation at the bottom of a drawer or “junk” pile, and the other 5 (just guessing: Mom, and four grandmas perhaps?) might put it away for safekeeping in a scrapbook. In all reality, the invitation is not something you should splurge on, since it plays a minor role once the wedding is announced, but you also don’t want to scrawl on a Post-It Note either. There’s gotta be a happy medium. I found that medium for my invitations. You could certainly make cheaper invitations than the ones I have. Mine cost me about $85 or so for 50 invitations, but I had a specific look in mind. 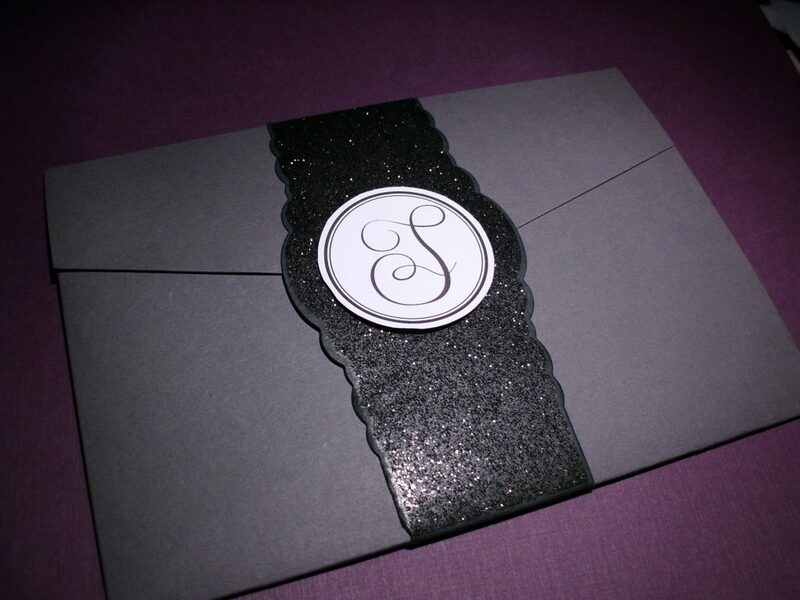 The bulk of the cost associated with my invitations was the pocketfolds. I could have made them myself, but I decided that my time and sanity was worth the $50 or so that I paid for them. I ordered them through Cards and Pockets and was super happy. You can order samples of the cardstocks to see the colors before you make your final selection! They have free pocketfold invitation templates and also a sizing guide for each pocketfold style, so you know exactly what size to cut your inserts to fit in that perfect “staggered” stair-step formation. 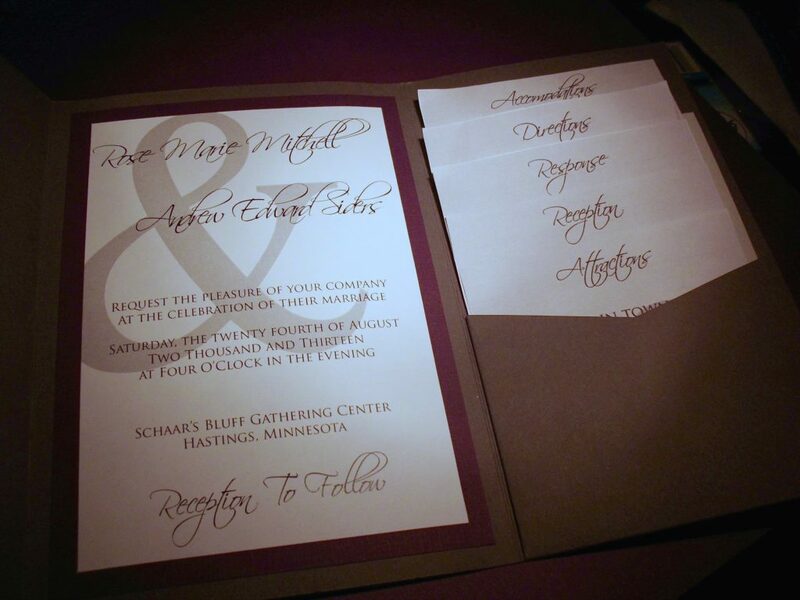 All it required was a 4.5×6.5 inch “mat” of plum paper, mounted to the pocket fold, and then the invitation printed on cardstock and trimmed to 4×6 which was then mounted on top of that. A rich look, much cheaper than printing in color. Ok, maybe it required a little more than just that. 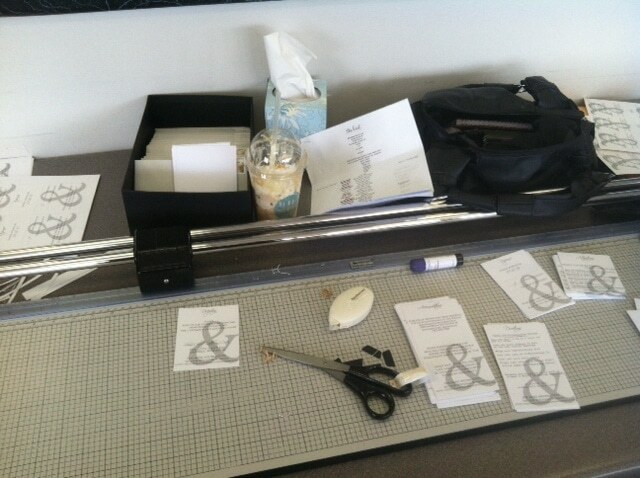 This was how I spent a couple hours for a couple weekends, at FedEx Office (Kinkos) using their slide trimmer to get perfectly straight cuts. For an added “luxe” touch, I took plain envelopes and scrapbook paper in a coordinating pattern, and cut to fit, then used a gluestick to adhere. I thought this added a really nice touch. If you feel you must have color printing, consider doing one or two keepsake ones with a fancier color design, and sending out the gray scale ones to guests. This will keep your costs low, and give Nana something to scrapbook, or cherish as a keepsake. 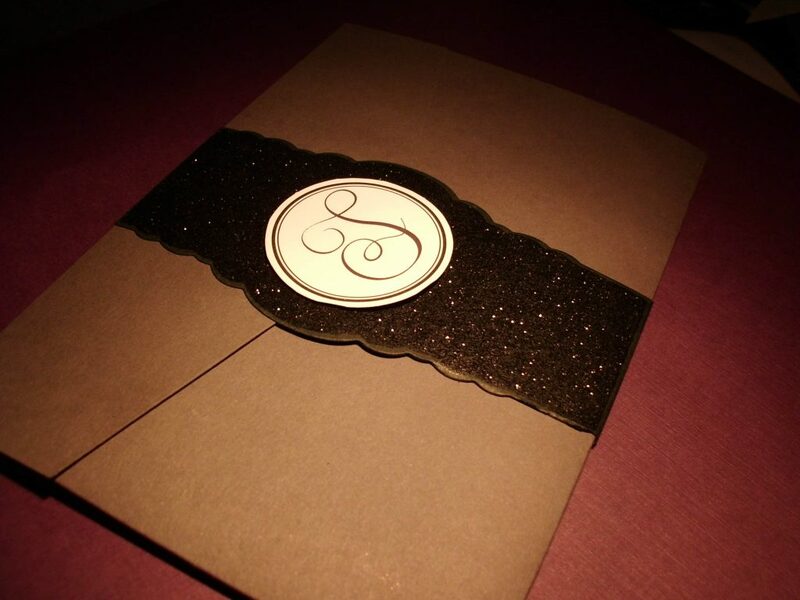 You can still have a lovely invitation on a tight budget! For those of you who are interested in what my insert card design looked like, I’ve included those below. 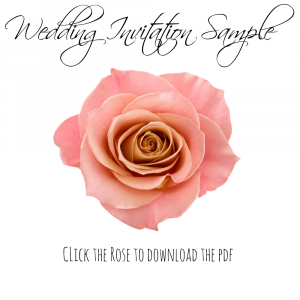 Since its multiple pages, you’ll need to download them as a PDF file, just click the rose image to start the download! It may take a minute or two to download, so please be patient, it is a big file! There are multiples of each one on a sheet (because saving trees is cool, no matter what anyone else says.) Feel free to replicate the design I’ve used if you’d like, but please, do so only for personal use and not for selling! Thank you for your cooperation! PS: The cursive font used is Scriptina and is widely available and free to use. 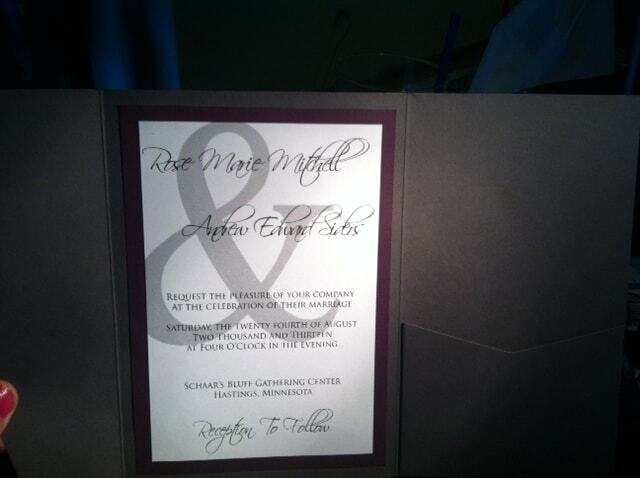 What do you think of my budget pocket fold invitations? Check out the rest of the $5k Wedding Wednesday posts here! I love your idea! Do you have a tutorial for these invitations?? I don’t, but I have gotten a lot of positive feedback on them, so I might have to do one! Glad you liked them! Thanks for stopping by! I love the idea.!! Would love to get directions in print as I am hard of hearing. I would also love to see your cards separately to get an Idea of wording. I like that its all in a compact bundle. How much did they cost to mail? Thank you! I will have to see if I can find the one I kept so I can add a photo of the cards. I used two stamps per envelope because I didn’t want to go to the post office. LOL They may have only needed one stamp, but I wanted to be sure they arrived. my theme is wolves rustic and always and forever. Colors Royal Purple and Turquoise. I have a vision of what I want the wolves to look like just need to figure out how to get it all on paper. Any help you can give will be greatly appreciated. I will have to make 150 of those babies lol. My goal is to pull this off at less then 5000 not counting my famous guest. Nathan Osmond. Chrissy, that sounds like a lovely theme and colors! I updated the post to include a few more pictures, and I found my original files for the card inserts. I created a PDF and linked to them in the blog post. Scroll all the way to the end of the post and click the image of the pink rose to download the file. That way you can see exactly what I had on the cards, and get an idea on how to set yours up. There’s lots of ideas on Pinterest too! Good luck with your wedding plans!